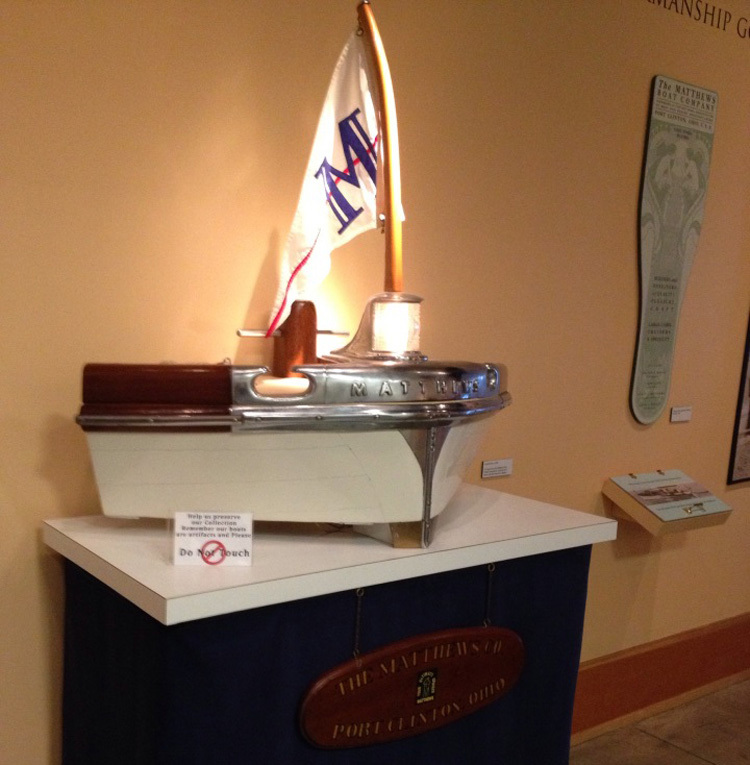 In 2013, the Antique Boat Museum acquired the Matthews Boat Company archive, the most complete boat collection known in the United States. For any interested parties or Matthews owners that would like to find out more about their boat, please fill out a Research Request Form and return it to Claire Wakefield, Curator, cwakefield@abm.org. The original Matthews company was founded by Scott J. Matthews in the basement of his home in Bascom, Ohio in 1890 and as the company grew so did the need for deep water and east coast access to market the larger boats. The Matthews Company moved to Port Clinton, Ohio where production continued until the early 1970's. The last wood boats were completed just prior to 1970 and the company, now under new ownership began to build 46' and 56' fiberglass boats. Unfortunately sales and production decreased steadily and in 1975 Matthews declared bankruptcy. In 1976 the company was auctioned and the buildings were boarded up. For nearly 20 years the buildings remained closed to the public. In 1997 the entire complex in Port Clinton was set afire by juveniles, destroying all the buildings in just three hours. Shortly before the Matthews plant burned, a group of MBOA members attended an auction of the contents of the original MBOA factory and gathered whatever Matthews paperwork, historic documents, etc. they could pack into their trucks. Edna Johnson, the club secretary and historian and husband Ted, along with the assistance of several other MBOA members, moved all that was gathered and packed to Higganum, Connecticut where the Johnsons built an annex to their home to store the treasure trove. For the next 15 plus years, Edna Johnson, along with the support of Ted, dedicated unprecedented hours of time and passion to sorting through the incredibly valuable historic documents. Edna cataloged them and essentially set up an MBOA archival library, providing members the opportunity to request archival packages that included copies of original brochures, sales receipts, layout plans, boat drawings, promotional material, etc. Sadly, Edna Johnson passed away on May 25, 2012 and with her passing it was decided that it was time to contact ABM and activate the agreement that had been established in 2005 for the ABM to become the repository for the archival collections of the MBOA. Shortly after Hurricane Sandy hit the east coast in October of 2012 and just when a nor-easter was scheduled to blow through, representatives of ABM bravely traveled to Connecticut with a moving truck, packed it to the brim with over 12,000 items from the collection and delivered it safely to Clayton, New York. 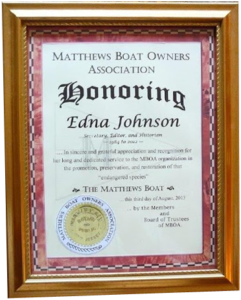 The MBOA and the Antique Boat Museum in Clayton, NY dedicated the transfer of the archival collection to the ABM library and honored past Secretary, Editor, and Historian Edna Johnson Aug 2-4, 2013.